PORTLAND, Ore.— The Oregon Court of Appeals has ruled that Cascadia Wildlands, the Center for Biological Diversity and Oregon Wild can proceed with their legal challenge to the state’s decision to prematurely strip endangered species protections from Oregon’s small population of gray wolves. Fewer than 120 of the animals are known to exist in the state. 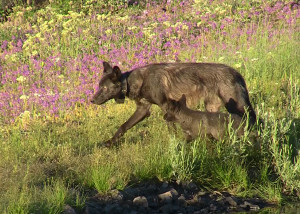 The ruling by the court late Tuesday reinstates a legal challenge filed in December by the conservation groups to last fall’s controversial 4-2 decision by the Oregon Fish and Wildlife Commission to strip state Endangered Species Act protections from gray wolves. Following that decision lobbyists with the livestock industry worked with several legislators during the 2016 legislature to pass House Bill 4040, a bill blocking judicial review of wolf delisting. Subsequent public records releases documented that despite public denials, the staff of Oregon Gov. Kate Brown was heavily involved in the legislation. In April the conservation groups’ legal challenge was dismissed after the Oregon Department of Justice argued that the lawsuit was potentially moot due to H.B. 4040. However, wolf advocates sought reconsideration by the court of this decision on the basis that H.B. 4040 was unconstitutional because it violated the separation of powers doctrine, among other issues. In yesterday’s ruling Chief Judge of the Court of Appeals Erika Hadlock wrote that the issues presented by conservation advocates’ legal challenge “are complex matters of public importance” that deserve further consideration by the appellate court. The wildlife commission’s decision to delist wolves was based on an Oregon Department of Fish and Wildlife analysis of the state’s wolf population that numerous leading scientists characterized as severely flawed and illogical. The wolf advocates’ opening brief is due to the appellate court on Aug. 23.